The Carnegie Institution held its annual Summer Scholars Research Symposium on Wednesday, August 6th. The ten students participating in the program this year presented the results of their work for the entire Broad Branch Road campus community. The presentations covered a wide range of topics, including mineral physics, organic geochemistry, astrobiology, petrology, seismology and astronomy. 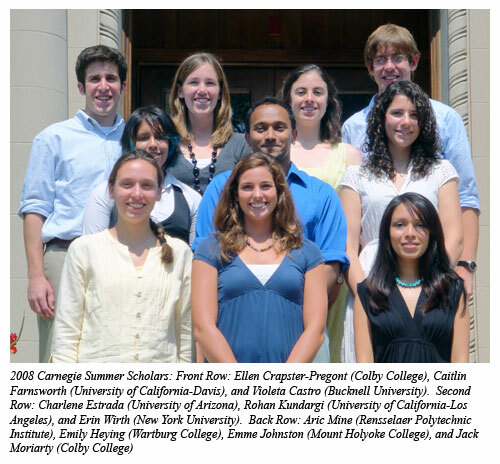 The Carnegie Summer Scholars program is sponsored by the National Science Foundation and its Research Experiences for Undergraduates (REU) program, and funded by the Air Force Office of Scientific Research through the Awards to Stimulate and Support Undergraduate Research (ASSURE) program. The high-pressure projects used the CDAC-supported facilities extensively. Participants come from throughout the country and work directly with a member of the Carnegie staff on a forefront topic in their mentors' areas of expertise. Most of the students will eventually present their work at a national meeting during the coming year.